If you ask around, one of the most positive things you’ll hear about Brush High School is the quality of the art instruction. The reputation of the art department was one of the main reasons we allowed our son to transfer into Brush from private school. In our family’s experience, the art department at Brush is run much like a college of art and design. The instructors focus on their primary discipline and all are working and award-winning artists. Instead of having generic art classes taught by instructors who teach all general aspects of art, if one takes a photography class at Brush, there’s reasonable assurance that it will be taught by Hadley Conner—an award-winning photographer. She gave our son a lasting passion for film photography—something he is putting to good use in his senior year at the School of the Art Institute of Chicago. Sarah Curry has given many Brush graduates a passion for painting and drawing. This is obvious by the number of Brush students and Brush graduates who attend the openings of her art shows around town, and cite Ms. Curry’s influence as inspiration for pursuing their own art careers. It would be impossible to overstate that the dedication of the Brush art teachers has led to positive, sometimes life-changing outcomes for many of their students. Many students who may never have considered a career in art, found their passion at Brush and have gone on to pursue impressive careers in art. Brush students consistently rank among the top in local and regional art competitions. Entering these competitions requires the teachers to go above and beyond to help the students prepare and submit their work. Each year our students receive scholarships, and sometimes full scholarships to art school. Art education is under threat. Funding for art programs is being cut at the federal level and we have an administration in Washington that clearly does not value public education. There is always a temptation when funding becomes scarce, to reduce or eliminate classes, like art and music, that are considered to be electives. What can we do? It’s time to be engaged as families and start standing up for the value of art education. We can’t take it for granted. We need to work together to ensure that our children and those to come, have access to the best quality art education in South Euclid Lyndhurst Schools. It’s something that truly sets our district apart, yet it can be so easily lost. On the evening of January 19th, 25 people came to the South Euclid Lyndhurst Public Library and spent two hours in a productive and passionate dialogue about our SEL Schools. Personal stories were shared, rumors were confronted, hopes and dreams for the future of our schools were discussed, and an idea was born. SEL CARES (Caring About Results for Every Student), is an idea that has come out of this conversation. It’s a grass roots effort to involve more community stakeholders in our schools. During the meeting, volunteers signed up to serve each school building, making the commitment to host informal meetings and get more involved in the schools by attending Board of Education meetings and staying present in the schools and with other parents. These groups hope to allay the fears of parents at times of transition to other school buildings, such as when students are moving from their elementary building to Greenview. Parents who have already been through these transitions will host meetings to answer questions and hopefully reassure these parents of a smooth transition. Those in attendance felt that this was an important missing link and that many families are lost at transition times. As many of you know, the SEL Experience Project is a grass roots initiative to share stories and dispel negative rumors about our school district that has led to white flight and community disinvestment. This meeting was the second community conversation we’ve convened since beginning this work. The conversation was important and eye-opening. We wanted to share the highlights here to keep the dialogue going and increase community engagement. Many personal stories were shared of the kindness of staff, teachers, and students who went the extra mile to help or made students feel accepted and helped them to excel. The diversity of our schools was cited as a big positive, the majority feeling that it has led to students being more social justice oriented and inclusive. Academics are considered very strong at SEL Schools, and much pride exists for the new exercise science facility and all of the AP and enrichment programs like Excel Tech, that help make students career-ready. Art and music are considered strong programs that set the district apart. The incredible success of many of our students in academics, art, sports, and enrichment activities were cited as a positive. SEL students are going to great colleges and are out in world achieving high levels of success. Overall, attendees felt that it’s important to keep sharing the positive stories and use new methods of communication to reach the people who need to hear it the most. Among attendees, there was a strong feeling that the faculty are not as valued and supported as they should be. There appears to be strife between the faculty and administration which is causing dissatisfaction among teachers and could result in the loss of good teachers as they pursue other opportunities, or apathy and a loss of teacher-led programming like clubs. There was a feeling of a lack of transparency from the administration, especially regarding explanations about the funding sources for new projects and the elimination of certain programs. It was suggested that a bigger effort was needed on the part of the administration to recruit and retain families and staff. The schools may not be effectively selling themselves to compete with private options and other districts. Police presence on Mayfield Road at dismissal may be causing additional negative perceptions. The District may not be fully addressing the real concerns that parents have like discipline issues within the school buildings and on school buses. Some concerns were expressed that sports is being emphasized to the detriment of academics. Overall, it was felt that by increasing community engagement and by recognition of the concerns of faculty and a greater effort at team building, any negatives could be transformed to positives, building on all the great qualities already in place. It is our hope that all parties come together to keep promoting the many positives of SEL Schools, work aggressively to address the concerns, and help build the support of the community. It’s about working together for our kids. If you would like to be part of SEL CARES, please email us at selexperienceproject@gmail.com. Lyndhurst residents Laurie and Jim Kowalski have three children: Kristen, 23; Alex, 19; and Charlie, 18. Both Alex and Charlie have special needs. The Kowalskis credit SEL staff for helping each of their children realize a high level of achievement. Kristen, class of 2011, is an Occupational Therapy student at the University of Pittsburgh. While at Brush she excelled at sports and academics, and thrived in many extra curricular activities. She was accepted into the OT program at Pitt as an incoming freshman– an impressive accomplishment. This summer she received a scholarship to work abroad for five weeks in New Zealand, working with adults with developmental disabilities. She will then be interning at St. Jude’s Hospital in Memphis and at the Cleveland Clinic for the remainder of the summer. Kristen’s desire to help those with disabilities began when she was a child, influenced by her brothers’ special needs and the diversity she experienced first-hand during her SEL education. Alex, class of 2015, has Down syndrome, and spent his SEL career in an inclusive classroom setting. He is currently working in the community through Cuyahoga East Vocational Educational Consortium (CEVEC). This summer he is working at TJ Maxx and will be working next fall at the Mandel JCC and is exploring college options. Charlie, class of 2017, will be starting his senior year at Brush next fall. He started his SEL career as one of the first students in the Autism unit at Sunview School, and has a special aptitude for computers and art. He was accepted into the Excel Tech graphic design program, and is exploring college options to pursue a career in a related field. Driving down Harwood Road in South Euclid you might notice a tidy Colonial with soccer goals in the front yard. Tom and Joellen Denk have lived in their charming South Euclid home since marrying in 2003. “When we purchased our home in South Euclid, we heard a lot of supportive comments about the neighborhood and our ‘starter’ home. As we settled in and our priorities became clear, we felt we could remove the ‘starter’ tag from our home,” explained Tom. The Denks’ commitment to the South Euclid community extends to SEL Schools, where their two sons, who are 8 and 6, attend Rowland School. Tom explained the family’s decision to use SEL Schools: “We attended an Open House in the spring before our first son attended Kindergarten. We found the K-3 program very organized, with appropriate class sizes, aides, and support staff. Our oldest son is gifted and his teachers identified some action plans that would keep him engaged. Our neighbor’s children went through the District and we heard positives about their experiences. Joellen teaches at a neighboring district. Our sons’ education is a priority and we feel they are in capable hands”. Tell us why your family chooses SEL Schools! Please copy and paste your answers to the following questions and email them to us at selexperienceproject@gmail.com and we may use them in an upcoming blog post! Don’t forget to include a family picture! Where do you live and how long have you lived there? How many children do you have and how old are they? Where do your children attend school? What do you like about SEL Schools? What do you wish people knew about SEL Schools? When Beth Fry and I started the SEL Experience Project blog our goal was to highlight all the positive outcomes and stories from the South Euclid Lyndhurst School District and to have an “honest” conversation about the rumors and negative perceptions that have resulted in an erosion of support for our schools. The “honest” part is the hard part. It’s hard to talk about race and social class. I don’t feel qualified myself. I’m uncomfortable doing it, yet someone has to try. I’ll start by sharing my family’s story and do my best from there. In 2001 we moved into our home on South Belvoir in South Euclid. Before long we were hearing negative stories about the schools. We were told that we “couldn’t use the schools”. At the time our school district had excellent ratings, yet there was so much negative neighbor-to-neighbor talk. Frankly, I didn’t think much about it since our extended family had a long-standing tradition of Catholic education. We just enrolled our son in Catholic school and that was that. It wasn’t until 2008 when I became South Euclid’s Housing Manager that I began to fully grasp what a high price we were paying as a community because of these negative perceptions. To be sure, our city like many others, was hit hard by the housing crisis. Almost 20% of our housing stock has been in foreclosure. Much of that was a result of predatory lending, but compounding that and predating that, there has been a long and disturbing trend of families moving away in search of “better schools”. During the crisis this occasionally showed up in the form of “strategic defaults”—people who could pay, but decided to stop paying on a mortgage. In some cases, these people purchased other homes elsewhere, then walked away from their South Euclid home. While strategic defaults weren’t widespread, I saw cases I could tie directly to negative school perceptions. In meeting with Realtors, I heard over and over again that the poor reputation of our schools was creating a problem with property sales. Our homes are selling to young professionals, single folks, and empty nesters, but not to as many families with children. As a result we are seeing a trend of smaller household sizes. Rental properties have increased in South Euclid and other inner-ring suburbs as a result of the glut of bank-owned properties that were sold to investors and because of homeowners who have moved and rented out their homes. Many of these homes are now occupied by lower-income families who use the schools. As we lost middle class families and more lower income folks began using the schools, we saw a shift in the demographics of our school district. In 12 years, our schools went from being predominantly white to predominantly black. Our school poverty rate increased over 2,400 percent and we became a Title 1 school district, which means that more than 40% of our school population is on free and reduced lunch and our district is eligible for special federal subsidies. The schools no longer match the demographics of either community they serve. Both South Euclid and Lyndhurst remain predominately white and middle class, although the level of diversity in both cities continues to increase. As a result of the increased poverty levels of the schools, our test scores and state rankings have decreased. It was a self-fulfilling prophesy—as residents convinced each other that the schools were no good and decided to flee, it became clear, based on the ratings, that they had indeed become far worse. Except that they haven’t, and that’s where this gets complicated. When our son Chris was in eighth grade he announced that he did not want to remain in private school for high school. This came as a shock to my husband and I and I’m embarrassed to admit that we fought him on it. In the end his stubbornness won out and he was enrolled at Brush High School. Little by little we realized that in spite of everything we’d heard, there was absolutely no truth to the negative rumors. Chris loved Brush and received a great education. When he graduated in 2014 he got an impressive scholarship and is now a sophomore at the School of the Art Institute of Chicago. The dedicated faculty and outstanding programs continue to exceed our expectations. Our daughter Sarah is now a freshman at Brush after spending eight years in private school. She loves the school, especially the fact that the other students are kind and accepting, something that wasn’t always the case at her former school. On her first day at Brush, the first group of girls she encountered in the cafeteria immediately waved her over and invited her to sit with them for lunch. Not much has fundamentally changed about the curriculum at the district since it had excellent ratings. District wide, there are over 30 AP and Honors classes, scores of extracurricular offerings, a STEM program, opportunities to earn free college credit while in high school, 58 sports teams, including a gorgeous stadium, and world-class music and art instruction. There’s even a farm to fork program that brings local produce to our cafeterias, and the impressive Excel Tech program, that allows students real world training in over 22 vocations. It’s not a stretch to say that if all of our residents decided to start sending their kids to the district, our rankings would quickly be back to where they were 12 years ago. That’s the frustrating part. Now, we’ve come to the hardest part. The unspoken but prevailing narrative is that if you’re black and low income the schools are just fine for you, but if you’re white or middle class, the schools aren’t good enough. There are plenty of code words and phrases that people use to say it, like “the schools have changed”, but what is really being said is that since the schools are predominantly attended by minority students, they must be inferior. I like to think that we’ve come a long way in terms of equality and acceptance in our little community, but this is still a chasm that sometimes feels insurmountable. Worst of all, the students are aware of the negative things that are being said—they read all those nasty remarks on social media and Cleveland.com. Sarah was told by her former school peers that if she went to Brush she would probably be stabbed and have no friends; that it’s a “ghetto school.” I never thought that something as simple as sending my children to a neighborhood school could be considered an act of defiance, but in way it is. Another private school mother who sent her children to Brush told me her story. She explained that she and her kids took a lot of abuse for using the public school, but that she felt it was the best thing she has ever done for them in terms of preparing them to live in the wider world. Academically, her children have excelled. They received impressive college scholarships and have gone on to seek advanced degrees. After having worked on our storytelling project for the better part of a year, I can say that one of the most surprising things I have discovered is that our graduates tend to be highly motivated by social justice and by and large want to go out and make the world a better place. Many already have, and we love to tell those stories. But all this negativity has taken a toll on the morale of our students, faculty, and the community at large. It needs to stop. By far, our school district is one of the largest pieces of our municipal infrastructure. It’s not disposable and neither are our communities. Our city is recovering. Due to a lot of hard work and innovation on the part of city staff, we’ve seen over $100 million in residential and commercial investment in our city since 2010. New homes are being built and values are increasing. Unfortunately, our residents are limiting our success. By saying negative things and continuing to feed the destructive narrative about our schools, we are undermining our own property values and perpetuating a cycle that is harming us all and further dividing us. The only way this is going to be solved is the same way it began—by changing our everyday conversations over the backyard fence, at the grocery store, and on social media. Our kids are worth it and our neighborhoods are worth it. Dr. David & Alice Miller moved into their South Euclid home in 1996. 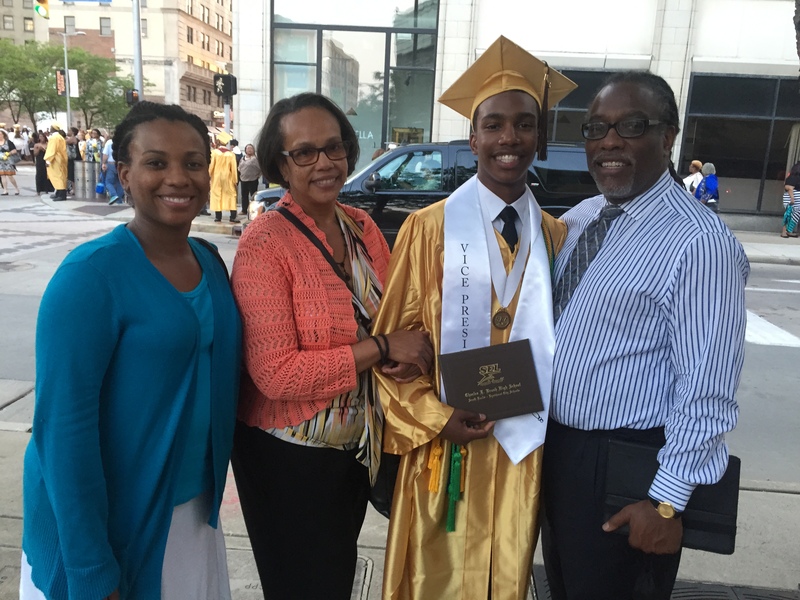 Their son, David, is a 2015 graduate of Charles F. Brush High School and began his SEL experience in kindergarten at Lowden. He will be attending Case in the fall. Dr. Miller serves as a professor in the Jack, Joseph & Morton Mandel School of Applied Social Sciences at Case Western Reserve University. Mrs. Miller is a social worker by training and works at the VA with EEO discrimination cases. They are active members in the community, with Dr. Miller is finishing out his term on the South Euclid City Council. Please indicate “SEL” in the memo line. Ari Daniel Shapiro, Valedictorian, Class of 1997, brings science reporting to the world through public radio. Nikki Woods, Class of 2008, Director of the Cleveland Institute of Art Reinberger Gallery, on the value of arts education.